RC servos are popular because they are low-cost packages that include a motor, gearbox, and control circuitry with feedback, and they are often a compelling choice for projects that include many degrees of freedom, such as robot arms and walking robots. RC servo controllers are interfaces between a primary controller (such as a PC or a microcontroller such as an Arduino or Raspberry PI) and the many servos, which can become a burden for the primary controller to control directly. Features to look for in a servo controller include how many servos it can control (including the ability to cascade controllers to increase the number of servos), the resolution and range, the versatility meaning that application parameters can be programmed. ASCII Control Interface, a two-way ASCII-protocol which allows you to control and program your SSC with a standard terminal program such as Tera Term or TTY. For medium to larger size systems with a number of intelligent modules such as a robot the PiKoder/SSC PRO features an I2C bus interface. This allows the main microcontroller to manage a complete network with only two pins.A very simple portocol - similar to miniSSC - provides for controlling the servo channels. this complete bus logic is implemented in hardware meaning that the performance requirements for communication would be minimal. 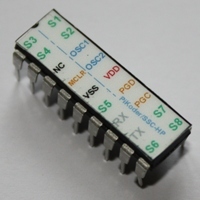 By using the I2C bus the programming of the PiKoder/SSC PRO can be done in "in-place" using the UART port. This greatly simplifies the setup of application specific parameters. Additionally, the PiKoder/SSC PRO provides for an "echo"-feature which echos all recieved I2C commands to the UART port for debugging and logging purposes to be copied by a standard terminal program. The PiKoder/SSC Serial Servo Controller controls up to eight servos through a serial interface. You can connect e.g. your Arduino or Raspberry Pi without any additional hardware to the SSC. A USB-converter allows you to control the servos from your computer. 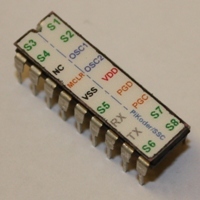 The PiKoder/SSC-HP is a single chip solution for a high precision serial servo controller (SSC) which gives you full control of up to eight servos or electronic speed controls with a resolution of 0.2 μs which is currently the best resolution available in the industry. The PiKoder/SSC PRO Serial Servo Controller offers the control of up to eight servos either via I2C bus or through a UART serial port. Microcontrollers such as an Arduino or a Raspberry Pi feature these interfaces - there is no need for any additional hardware adaptor. 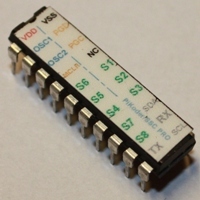 If a PC is taking the host function then an off-the -shelf USB-UART would be needed to connect the PiKoder/SSC PRO to a USB port.